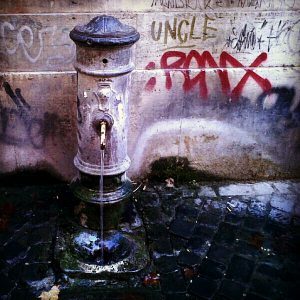 A nasone (plural nasoni), is a type of drinking fountain in Rome. Literally it means “large nose”. Most nasoni share a design in the shape of a column. The form of the water spout varies but most nasoni have a metal spout protruding at mid-height which looks like a nose and gives the fountains their name “large noses”. Other designs include wolf-heads, dragons and lions. The city of Rome began installing nasoni in the 1870s to provide a water supply for citizens. The exact year is not known: sources note both 1872 and 1874 as the first time a nasone was installed. Most are made of simple stone, although in the 1920s and 1930s nasoni were made of travertine marble, some of which remain today, mostly in parks and the Foro Italico area. The water coming from the nasoni is the same supplied to the city’s households and thus safe for drinking. It is continuously running from the fountain through a hole at the bottom of the spout and then recycled if not used. Additionally, most nasoni have a hole located at the top of the spout, allowing thirsty citizens to drink from the fountain more easily by blocking the bottom hole and forcing the water upwards. 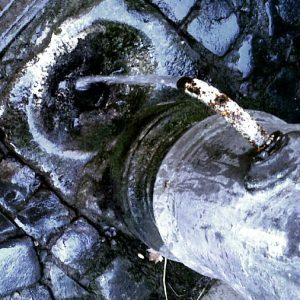 There are approximately 2,500–2,800 nasoni in Rome, supplying citizens and tourists with free drinking water.